Researchers at Virginia Tech have found that there is as much as a 25° F difference between the bottom and top stack of flounder fillets placed on ice. When temperature increases of as little as 2° F can cause exponential growth in food borne pathogens, clearly this is not acceptable. "Temperature control is the most effective way to slow bacterial growth, delay seafood spoilage, and maintain seafood quality." 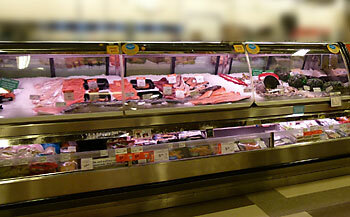 Retail seafood displays are often lit to the extent that inappropriate surface heating occurs. Product losses and spoilage due to this surface heating decreases not only food safety but also comes off the retailer's bottom line. Promolux® Safe Spectrum® technology supports the safest and most attractive illumination available for seafood display lighting solutions. Marketing Guidelines for a Retail Seafood Department: Customer Needs, Management, Quality Assurance and Merchandising, Charles W. Coale et al. Sponsored by Sea Grant at Virginia Tech, Mid-Atlantic Fisheries Development Foundation, Inc., and National Marine Fisheries Service. VPI-SG-88-01. "A survey by Food Marketing Institute revealed a strong correlation between display size and shrinkage. Stores with long full-service seafood case frontages indicated an overall shrinkage rate of 15 percent while those with small departments experienced just 5 percent. Interestingly, the reverse was true for self-service operations." "Texas A & M specialists have observed that the air just two inches above a bed of ice in an unrefrigerated case may be at room temperature. Similarly, researchers at Virginia Tech have recorded as much as a 25° F difference between the bottom and top of a stack of flounder fillets piled on ice. Obviously this is not acceptable." Food Safety: Federal Oversight of Seafood Does Not Sufficiently Protect Consumers. (A download) Report to the Committee on Agriculture, Nutrition, and Forestry, US Senate. January 2001. GAO United States General Accounting Office, Washington, D.C. 20548. Read full article here. "Contaminated food products cause an estimated 76 million foodborne illnesses annually in the United States, according to the Centers for Disease Control and Prevention (CDC). Seafood (finfish and crustaceans) represented about 15 percent of the documented foodborne illness outbreaks in the United States, according to CDC's data for 1997, the latest year for which such data are available. Seafood-related illnesses could result in a variety of problems, ranging from mild gastrointestinal discomfort to neurological damage or death." "Biological, chemical, and physical hazards can cause seafood-related illnesses. Biological hazards include clostridium botulinum, listeria monocytogenes, salmonella, and pathogenic staphylococcus." "According to FDA officials, two naturally occurring marine toxins with potentially serious health effects - scombrotoxin and ciguatoxin - cause most reported seafood-related illnesses, including gastrointestinal and neurological problems." "In 1999, FDA analyzed a total of 769 domestic seafood samples (of which 473 were analyzed for the presence of biological hazards) and found that 94, or 20 percent, contained hazards such as salmonella, listeria, and scombrotoxin. FDA officials said that, unlike meat and poultry, seafood is affected by a variety of microbiological and chemical pathogens and that there is no single widespread bacterial hazard, such as salmonella, in meat and poultry." "While all seafood may not be affected by a single widespread hazard, such as salmonella, some species of seafood are often affected by specific hazards. For example, tuna, mahi-mahi, and bluefish are likely to produce histamines when not kept at the proper temperature. The resulting illness - scombroid poisoning - causes nausea, diarrhea, sweating, and headaches. Similarly, subtropical and tropical fish, including grouper and snapper, accumulate a naturally occurring toxin, called 'ciguatoxin.' Ciguatera poisoning involves a combination of gastrointestinal neurological and cardiovascular disorders. Scombrotoxin and ciguatoxin, which cannot be eliminated by cooking, contributed to over 88 percent of all confirmed food illness outbreaks for seafood reported by CDC in 1997." Retail Seafood Cross-Contamination. Robert J. Price, Ph.D. Seafood Network Information Center. Department of Food Science & Technology, University of California, Davis. UCSGEP 90-6 August 1990. Read the full article here. "Seafoods, like other foods, may contain illness-causing bacteria and viruses. These microorganisms come from the marine environment, water pollution, or contamination. Contamination may be from seafood handlers, equipment or the environment." Retail Seafood Temperature Control. Robert J. Price, Ph.D. Seafood Network Information Center. Department of Food Science & Technology, University of California, Davis. UCSGEP 90-5 August 1990. Read full article here. "Bacteria are the major cause of seafood spoilage. Millions of bacteria are on the surface, on the gills, and in the gut of living fish and shellfish. After harvest, bacteria invade the flesh of fish and shellfish through the gills, along blood vessels, and directly through the skin and belly cavity lining. These bacteria grow and multiply in the flesh. They produce the 'fishy' smelling and tasting compounds associated with old seafood. If food-poisoning bacteria are present, they can multiply and cause illness." Meat, Poultry and Shellfish Safety. Susan Osaki and C. Gavranich. University of California Cooperative Extension. Publication #31-446. "All raw meat, poultry and shellfish are contaminated with bacteria some of which may cause food poisoning; therefore these foods require careful handling and proper cooking to guarantee their safety." "Temperature control is the key to safe handling. Shellfish should never be allowed to stand at room temperature for more than two hours. Bacteria that cause food spoilage or illness, or both, multiply rapidly at room temperature. Refrigerator temperatures of 40° F or less significantly slow the growth of spoilage bacteria and stop the growth of food poisoning bacteria."